Submitted by Sasha.antonenko on Wed, 02/22/2012 - 17:40. 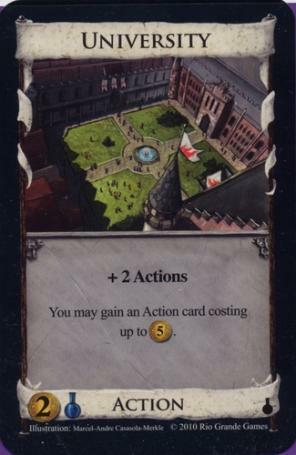 Question about the University card: Does the "gain action card" count simply as the card's ability and after using it the player still has a buy phase, or does using up the ability count as the only buying phase? Also if it does count as a buying phase can I add other treasure to it to buy more expensive action cards? Submitted by andrewrbrown1 on Thu, 02/23/2012 - 11:48. The 'gain an action card costing up to 5' is part of the card's ability and does not affect your buy phase. You can still use any money you have to buy during your buy phase. Also, you can not add money to the 5 you get from University. Submitted by Sasha.antonenko on Thu, 02/23/2012 - 19:16.